Climate Information for Public Health Action is based on the premise thatclimate knowledge and information can help protect the public from climate-sensitive health risks. With a focus on infectious disease, hydro-meteorological disasters and nutrition, the book explores why, when and how data on the historical, current and future (from days to decades) climate can be incorporated into health decision-making. 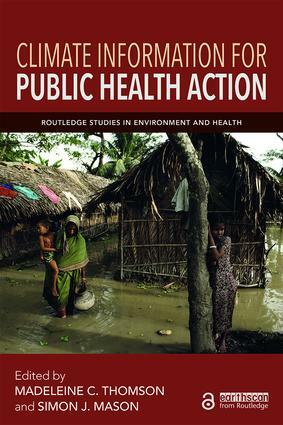 Created as a collaborative effort between climate and health experts, this book targets a broad technical public health community, alongside development practitioners and policy-makers engaged in climate change adaptation. It may also guide climate experts in the development of climate services tailored to health needs. Written in an accessible, informative style, while maintaining the highest technical and scientific standards, it will also be a valuable resource for students and academics studying and working in the emerging field of environment and health. The Open Access version of this book, available at http://www.tandfebooks.com/doi/view/10.4324/9781315115603, has been made available under a Creative Commons Attribution-Non Commercial-No Derivatives 4.0 license."